Want to help raise awareness of heart valve disease? 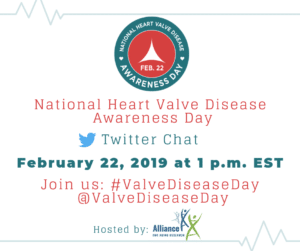 Participate in the National Heart Valve Disease Awareness Day Twitter Chat on February 22, 2019! Join Valve Disease Day partners and organizations from 1-2 p.m. on the 22nd using the #ValveDiseaseDay hashtag. Don’t forget to follow the official Valve Disease Day Twitter account (https://twitter.com/valvediseaseday) for the latest updates on the Valve Disease Day campaign. If you’re interested in using social media to raise awareness of heart valve disease, check out this short video. Learn more about the National Heart Valve Disease Awareness Day campaign at http://www.valvediseaseday.org. Questions? Email Janelle Germanos at [email protected].